I have had several people ask me recently what is included in our adoption process and how far along we are... so I thought I would try to take some of the mystery out of the world of international adoption. Well, at least adoption from Ethiopia. We are by no way experts; we're learning as we go. And I know to expect the unexpected, delays, and the like. So, even though we know what is supposed to happen, we are not getting our hopes up for a flawless journey. It literally took several years of praying and thinking and reading about adoption to finally decide as a family to "let's do this!" We did look into domestic adoption in Canada (when we lived there) and the US, but God closed those doors for our family. So, international it will be. The next step was very daunting. It is the step of looking at countries to figure out which program is a good fit. Requirements for each country are different in such areas as age, income, number of children in the home, ages of adoptable children, length of stay in the country, etc.... When people ask, "How did you choose Ethiopia?" I like to say that Ethiopia chose us. Or God chose Ethiopia for us. I can't really tell you, other than that. The details surrounding an Ethiopian adoption fit our situation better than any other country available to us. After deciding on Ethiopia, we had to find an agency that could facilitate our adoption. 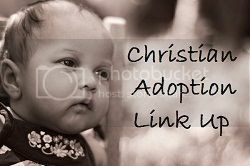 You can find much information to start with on the U.S. Department of State intercountry adoption website. Next up, home study. We had four visits with a social worker in our home, answered countless questions, and filled out detailed paperwork about our backgrounds, family, beliefs, etc. We also had to have physicals and criminal checks done. Our first home study visit was on September 8th, and we had our completed home study in our hands by December 14th. By the 18th, our home study and some other documents were on their way to USCIS (Citizenship & Immigration) along with our "Application for Advance Processing of Orphan Petition." They'll give us a fingerprinting appointment, then once we get USCIS approval, we can send all our documents (dossier) to Ethiopia. At that point, we will wait (don't know how long?) for a referral of a child. We are requesting a girl between the ages of 0-4 so that we don't mess with birth order. This adoption will require 2 trips. On the first trip we will meet our little one and finalize the adoption with the Ethiopian court. Then, we will return home for several weeks (months?). When we return, we will get our child's exit visa, and bring her home! God has provided little by little for this adoption through the generosity of friends & family, through our personal savings, people using our amazon link, sippy cups of change, Just Love coffee, and through little things like my etsy shop! Now that our home study is done, we can also apply to the many organizations that offer grants to adoptive families, such as AbbaFund. Each step of the way there is a new fee due, so we are updating our "fundraising thermometer" on the side bar to show an approximate round number that this adoption will cost, travel included. We're going to say $30,000 (although in reality, it's going to be a bit more). Hope this post was helpful in understanding a bit of the journey we're on. We're still excited to see how God will lead, provide, rescue, and show His glory through this adoption! Do you love coffee? Does someone on your Christmas list love coffee? Here's an idea that is win-win-win. If you buy some Just Love Coffee from our storefront, your gift recipient will have a coffee lover's dream delivered right to their doorstep for Christmas, you can cross another task off your list, our family will get $5 per bag toward our adoption, and you will be supporting a wonderful company that also gives money toward helping communities in Africa have clean water. So, in addition to helping our family to adopt, 5% of all sales of Just Love coffee go to Charity: Water through the Coffee to Water program. In this way, this company is also trying to prevent children from becoming orphans in the first place. Just Love Coffee also purchases only organic, shade grown, coffee beans - Fair Trade Certified. So, you can feel good about the product you are buying! Will you consider giving the gift of love & coffee this Christmas? Mmmm, love & coffee - the perfect blend. Just Love. Yes, I know, it's difficult to wrap our minds around the fact that the countdown to Christmas has begun. Especially when summer vacation is still fresh in our memory. But, the truth is that Christmas is just 97 days away! Okay, now that you're hyperventilating, I want to help you out. Everyone knows that planning ahead and shopping early takes a lot of the stress out of the season. So, why don't you consider getting that head start and helping our adoption at the same time? If you shop on amazon through our link, we will receive a small percentage of the purchase price. Every little bit helps, and if you plan on shopping on amazon anyway, why not just use our link? Feel free to pass it on to family and friends who might be interested. And not to be left out, our Canadian friends and family can use our amazon.ca link here! Just Love Coffee Roasters supplies fair trade organic coffees from all over the world. This would make a great gift for the coffee drinker in your life... or the person who has everything. You just can't find coffee like this in the grocery store. And for every bag you purchase through our storefront, we receive $5 toward our adoption. This company has a great story which you can check out here. Thank you in advance for your help & support! Yes, we have written our first big check for this adoption process. We contracted with an agency in Texas that has an Ethiopia program. Soon we will write another check for our home study, which will be done by a local agency. And so it begins. We are thankful that God has placed adoption on our hearts. And we are thankful for the ways He is paying for it. Our parents' yard sale last month. Several random gifts from friends. Change from sippy cups. Sales from our JustLove Coffee Roasters storefront. And to let you know where we are in the process, check out the fundraising thermometer on the sidebar. As of today, we have $947.48 toward our agency fee of $4950. Can't wait to see what God will do! Thank you to all those who have given, prayed, and encouraged! You are a part of His story in the life of this little one. We're traveling down this adoption pathway, and many of you have asked where we are in the process. So we wanted to fill you in on the main points of this journey. In all your ways acknowledge him,and he will make straight your paths. We applied to an adoption agency in May and are in the process of collecting documents to begin our home study. This would include FBI clearances, state criminal checks, medicals, reference letters, marriage and birth certificates, and income information. It's basically a paper chase right now and waiting for government agencies to return the clearances in a timely manner. The next step will be a home study with a social worker to verify for authorities that we are suitable parents and are going into this adoption with our eyes wide open. When our home study is complete, we will then gather documents for our dossier which is then sent to Russia to be translated. The Russian government will send us information on a child in their Baby Home that we can adopt. This is called a "referral". Then comes 3 trips to Russia! Trip 1 is for meeting our little one and signing our intent to adopt her. Trip 2 is for the court process. Trip 3 is for bringing her home! Thanks to those who have encouraged our family by buying coffee from our Just Love Coffee Roasters storefront! Don't forget to pass the link along and let your friends know that for every bag of coffee purchased, our family receives $5 toward adoption expenses. Several dozen sippy cups have also gone out throughout the State and even internationally! We thank you for your willingness and excitement to have a part in bringing our little one home to her forever family. We are brainstorming other options for raising money. International adoption isn't cheap. But it shouldn't be. It's a perfect picture of our spiritual adoption when we were rebel orphans. Reconciling us with God the Father was costly. It required Jesus Christ to humble Himself by taking on human form so that He could live the perfect life we couldn't live. He died as a substitute for us, and in His death, He absorbed all of God's wrath that was meant for us rebels! But this does not mean that every person automatically becomes a beloved child of God. You have to trust in Christ's finished work of redemption. You cannot continue to try to achieve God's favor in your own strength. You have to admit that you need Him. You need His forgiveness. You are a rebel orphan. You need the Father to adopt you into His family. You are not automatically born into God's family at birth. What a picture! What a cost! What a love! Our shipment of Ethiopian coffee from our Just Love Coffee Roaster's arrived. Perfect timing to enjoy on this drizzly day in Northeast PA. We are thankful for the Dads in our lives who have been examples to us. Our desire is to raise 4 sons whose lives are used mightily for God's Kingdom. And then we are excited to see a fatherless little girl become a beloved daughter in our family because of this adoption! Thank you to all our friends who have purchased coffee to help with these adoption expenses. And it's not too late to remember your dad on Father's Day with a unique gift of Just Love Coffee! You can let him know that every time he enjoys a sip of the coffee, this gift also helps bring a little girl closer to her forever family. Just Love Coffee Roasters is a wonderful company that we found by reading many, many adoption blogs over the last several years. Here's some of their story... Rob Webb continues the coffee business that his father started in Murfreesboro, Tennessee. In 2009, Rob and his wife adopted 2 children from Ethiopia. Soon they were discussing "what more they could do through the company to help the plight of the orphan...They decided that 5% of all sales of Just Love coffee would go to Charity: Water through the Coffee to Water program." How can coffee help a family? Watch this video to find out. What is the coffee like? In their own words, "We source only the finest Fair Trade, Direct Trade, organic, and shade-grown coffee beans from the best growing regions around the world." And yes, we have bought several bags already, and it is delicious coffee. How does it help us? Every time you buy a bag of coffee from our storefront, Just Love sends us $5 toward our adoption expenses. It's that simple. But it's a great help. What a great opportunity to be a part of our adoption story, enjoy some super coffee, and know that you're helping bring fresh water to communities who need it. Share our storefront link with family and friends. Buy a few bags for your dads, uncles, and brothers for Father's Day. Plan ahead to give a bag of Just Love Coffee to everyone on your Christmas list. This would make a great gift for new parents, teachers, or new neighbors, too! Spread the love. Buy some coffee. We took a little trek down to the border yesterday in Calais, Maine, to pick up a very special package and mail off another one. Our first shipment from Just Love Coffee Roasters arrived! We enjoyed the aroma on the 1.5 hour trip home. This morning we brewed up our Ethiopian Harrar and totally loved it. Maybe tomorrow we'll open the Ugandan coffee. It is great tasting coffee for a great cause. Each bag that you buy from our storefront puts $5 in our adoption fund. Plus, some additional proceeds go to an orphanage in Ethiopia. Plus, you get great coffee! Please pass the link around to friends and co-workers who might like to help orphans and their forever families with their coffee purchases. You know you'll spend the money anyway on coffee... so why not make it count for something bigger?? It’s a simple thing, to donate cloth diapers. And it’s a simple thing to buy your coffee from JustLove instead of the local grocery store. But, by doing so, you can look with compassion on the neediest and make a difference in their lives. It’s a tangible way to show love. Many years ago when we were just getting started in Ontario, we didn't have two nickels to rub together. Literally. We were expecting baby #1, John hadn't found a full-time job yet, and I couldn't work because I didn't have my permanent resident status in Canada yet. One of the neighbouring churches was hosting a ladies breakfast that I wanted to go to, but just couldn't justify spending the money for. Our assistant pastor's wife offered to pay for me to go. At first, I declined her generous offer, because I felt bad that she would have to pay double for her breakfast. But, in her wisdom, she insisted, and helped me learn a valuable lesson: don't refuse people the opportunity to show love, to be generous, and to be a blessing in your life! As you know, adoptions cost quite a bit of money. Our rough estimates at this point is that it could be around $25,000 (including travel). We're not worried about it, or stressed out, because we know God will provide. We don't own our money anyway, we're just stewards. And we can't think of a better way to spend our money if it comes right down to it. People finance new car purchases all the time, and they will not be worth much in a few years time. But, we are talking about rescuing a child from an orphanage in another country and placing them in our family, where we can show them the love of Christ! How can you put a price tag on that? We don't intend to beg or whine about money on this blog or in our lives. We want to stand back and be amazed at how big our God is, and to see Him "do far more abundantly than all that we ask or think" so that He gets all the glory. But He may want to use you to make a difference in the life of the child we will adopt. And so, we invite you to be a part of our adoption story! One way you can do this is to purchase coffee from a wonderful company called Just Love Coffee Roasters. Roasting Fair Trade Specialty coffees, Just Love uses proceeds to help an Ethiopian orphanage and families adopting not just from Ethiopia, but from anywhere in the world. Our family will get $5 for every bag of coffee purchased from our storefront. These would make great unique gifts for family and friends, and you can tell them that the purchase is helping an orphanage in Ethiopia and our family's adoption. Plus, you get great tasting coffee! This is a win-win-win situation!! Check out this great company, and see if God would have you be a part in our family's adoption story. Visit our Just Love Coffee storefront at http://www.justlovecoffee.com/BanksFamily or click on our sidebar button.